Jake 'The Snake' Roberts (right) and good friend Diamond Dallas Page. Jake "The Snake" Roberts told TMZ that he has a cancerous tumor behind his knee and will need emergency surgery to have the growth removed. This marks the latest battle in a series of challenges that has seen the wrestling legend overcome drug and alcohol abuse. 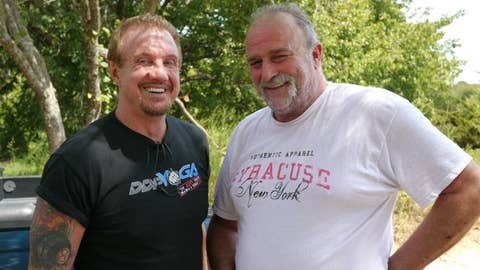 Much of his rehab has come through his friend and colleague Diamond Dallas Page’s efforts. Roberts told TMZ he is scheduled to undergo surgery Tuesday to remove the tumor, which is growing into his muscle. "If the devil can’t defeat me, cancer doesn’t stand a chance in hell! Pray for sick children who face this horrible disease ’cause The Snake will be just fine," Roberts told the entertainment site. Roberts also says he will be at his WWE Hall of Fame induction ceremony in New Orleans, prior to WrestleMania 30 in New Orleans April 6.